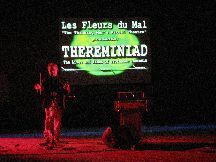 Les Fleurs du Mal, "The Thinking Man's Ritual Theater" (founded in New York, in 2000) is a traveling troupe, dedicated to re-marry science and art, in the form of electronic rituals. They are presently on a tour of Europe, with their new show, THEREMINIAD. It is an electro-theatrical epoch, based on the lives and times of Russian scientist and spy, Professor Leon Theremin, inventor of the world's first space-controlled electronic music instrument, the theremin. The sixth part of the series is Clara & Leon. It was first staged at Süss Fel Nap, in Budapest, on February 27, 2006. It is an electro-theatrical exploration of Professor Theremin's relationship with Clara Reisenberg-Rockmore, the greatest theremin virtuosa of all times. This multi-media ritual is composed of four segments, connected by narration. Les Fleurs du Mal's Internet-based approximation of the Theremin-story goes like this: Professor Leon Theremin and his invention, "The music instrument you don't have to touch in order to make it sound" arrived to New York in 1927. The scientist was invited to America by Clara Reisenberg-Rockmore and her wealthy family. She was an aspiring violin player. Her hands were partially paralized by a disease, she couldn't play the violin anymore. She was hoping, that Professor Theremin's invention can resurrect her artistic carrier. Her wish came true. She mastered theremin playing in a short time and became a celebrated star of the future-instrument for the rest of her life. A long time agent of the Russian intelligence service, Professor Theremin came to America with a double task. He was to propagate the superiority of Soviet science, and also, he was to secretly collect information on prominent American artists, scientists, politicians and military personel, whom he befriended as he was quickly found his way into the heart of High Society. Albert Einstein, Leopold Stockowski, Arturo Toscanini, Charlie Chaplin and Dwight Eisenhower were among his closest friends. He dutifully reported to Moscow on all. He was spying on his closest collaborator and lover, the Lithuanian emigrant Clara Rockmore as well. He planted a bugging device into the theremin he custom-built for Clara. Some say that it was Bob Moog, the inventor of the synthetizer, who accidentally found the bug in the instrument, as he was replacing a burned out vacuum tube, to the request of Clara Rockmore, long after the Professor was kidnapped from New York and was secretly taken back to Moscow in 1937, by Russian agents. Clara suspected that her friend and saviour was spying for the Russians, but she did not know that the inventor was reporting on her, too. After Professor Theremin has disappeared from New York, Clara Rockmore, and the scientist's Afro-American wife, the dancer Lavinia Williams were desperatelly trying to find him for decades, to no avail. Even Clara's American governmental contacts couldn't help locate the kidnapped celebrity. The Russian authorities refused to give information on his where-abouts. After a mock trial the inventor was found guilty of anti-Soviet propaganda and he was sent to the Gulag, to a special labor camp, built for scientist in Siberia. During his 13 years in the camp he was working on developing listening devices and voice recognition systems for the Russian intelligence services. Even after his release from the camp, in 1951, he was not allowed to keep contact with foreigners, until the system-change in Russia, in the 1990s. After his release from over four decades of house arrest, his American friends brought him to New York, with great fanfare in 1993. His wife, Lavinia Williams was dead by that time. Professor Theremin met with Clara Rockmore again, after 56 years long hiatus, and he did confess his snitching on her, over half a century ago. He was 97 years old, Clara ten years younger at their reunion. Clara easily forgave her old friend's treason. The Professor surprised her with a present, which he's brought from Moscow for her: a bottle of Clara's favourite Russian perfume. Shortly after their concert at the Radio City Music Hall, Professor Theremin died of a massive heart attack, while walking on Mott street, in Little Italy. Clara survived her friend by five years. On the day of her funeral, Clara's sister Nadia Reisenberg has found a miniature listening device, built into the silver top of the perfume bottle, which Professor Theremin gave to Clara at their reunion party. Nadia Reisenberg gave the bug to the family-friend Bob Moog, who forwarded it to the American authorities, after examining its circuitry extensively. Moog was amazed by the technical sophistication of the bug. He had no doubt that it was constructed and planted personally by the father of Russian bugging industry, the Professor himself. Yet he couldn't fathom, why on Earth would the present day Russian intelligence services would be interested in the private life of an old lady, who had no contacts to the High Society anymore.